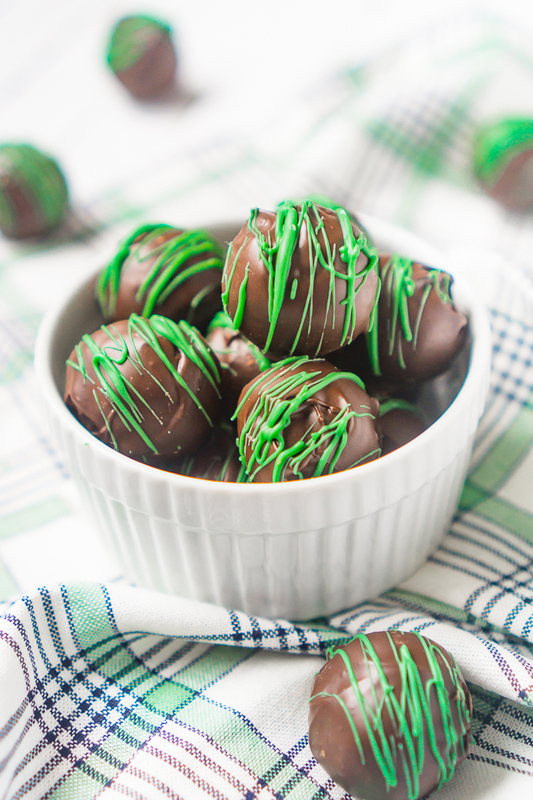 These Mint Chocolate Truffles using Grasshopper or Thin Mint cookies are addicting! While you’ll want to enjoy these all year long, they make the perfect easy St. Patrick’s Day dessert recipe! Creamy, flavorful and only 3 ingredients! 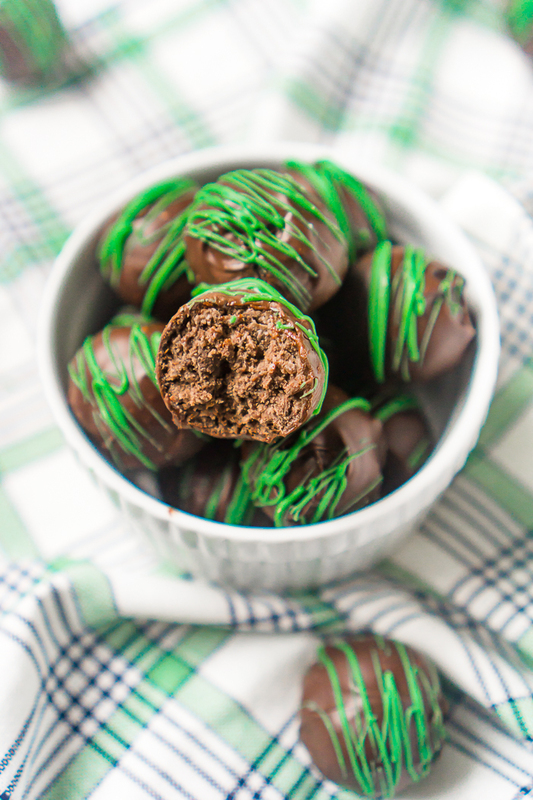 You won’t be able to say no to this easy St. Patrick’s Day dessert! So, how easy are these Grasshopper truffles to make? They require only 3 ingredients to make: crushed grasshopper cookies or Thin Mint cookies during Girl Scout Cookie season, cream cheese, and chocolate or candy melts for the outside coating. That’s it! Having a food processor or another way to quickly crush your cookies for the truffle recipe makes it even easier still! I really love dessert truffles that use a cream cheese base because they end up soft and creamy. Plus, you don’t need to make a cake to destroy like some recipes call for. I don’t have time or patience for that extra step. 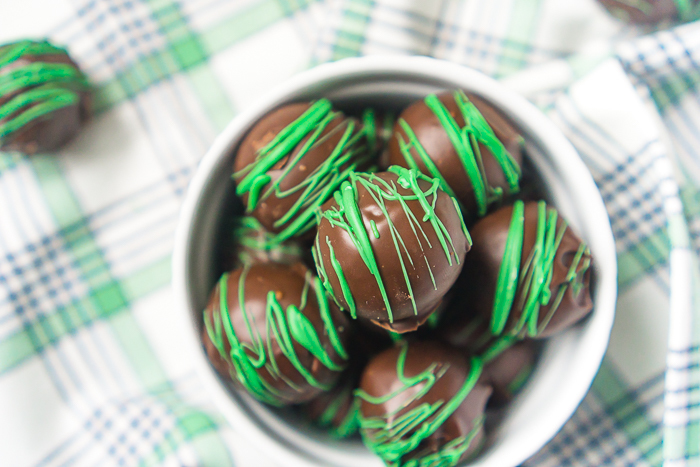 These Chocolate Mint Truffles are definitely easy enough though to make another batch before St. Patrick’s Day. Another batch of these would certainly make Bryan super excited. I might just have to make two batches – one for him and one for me! Combine crushed cookies and cream cheese. Roll into 1 inch balls. Chill in freezer. Melt chocolate coating. Roll chilled truffles in the chocolate and then chill them again. Melt colored candy melts if you’d like to add a drizzle. Are You Ready to Enjoy These Tasty Thin Mint Truffles?! Addicting Mint Chocolate Truffles with Thin Mint Cookies or Grasshopper cookies, cream cheese and chocolate coating! A Tasty St. Patrick’s Day recipe you don’t want to miss! In a food processor, add grasshoppers or Thin Mints and pulse until they are just crumbs. Depending on the size of your processor, you might need to do this step in a few batches. If you don't have a food processor, put the cookies in a big Ziploc bag and pounding them with rolling pin or the bottom of a glass until crumbs only. Mix the cream cheese and cookie crumbs together in a bowl until well-mixed. This is easier with soft cream cheese. Roll the mixture into 1 inch size balls. Place them on a parchment lined baking sheet and place in freezer (or fridge) for at least 30 minutes. I recommend using a pan with sides so they can't roll off. Once truffles are chilled, melt the chocolate or candy melts in a microwave-safe bowl in the microwave. Heat for 30 seconds at a time, stirring in between, until melted. Roll each ball in the melted chocolate until it is fully covered. I usually use a fork to move the truffle around until it is covered. Then, I use the fork to pick up the truffle and allow the excess chocolate to run off before placing back on the parchment paper. Repeat with all the truffles. Put the truffles back in the freezer (or fridge) until the chocolate coating has completely set. I also added a green chocolate drizzle to the top of my truffles. If you want to do this, melt in the microwave around 4 ounces of green candy melts in a microwave safe bowl in 30 second increments, stirring between. Then, take a spoon and quickly drizzle the melted green candy melts over the truffles OR add to a small Ziplock bag and cut a tiny corner off the bag to drizzle. Keep in fridge until you are ready to enjoy!